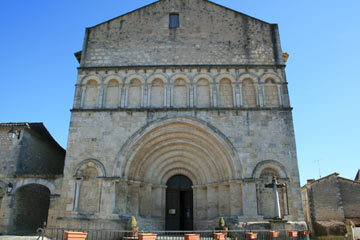 In the area surrounding Riberac there is a very high concentration of Romanesque churches. If you call in at the tourist office there is a leaflet with suggested routes to see the churches and interesting villages in the area. The countryside is pretty and the villages tend to be small and picturesque but with not a huge amount to see beyond the churches. None the less it is a pretty route to follow. 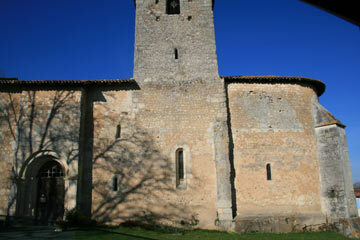 Romanesque church at St Privat des Pres: this is one of the most attractive churches in the Perigord. It is a fortified church and was an integral part of the defences in the region. This village is big enough to have a bar and a couple of small shops and there are a lot of very pretty buildings in the village. There is a Museum of tools and village life in St Privat des Pres. Romanesque church of Bourg du Bost: The other side of the church is actually more attractive but as I was stepping out of my car 3 bulls escaped from the neighbouring farm and entered the churchyard! I beat a hasty retreat. After an initial flurry of excitement the old lady of the farm lost interest and disappeared back into the farmhouse so I was glad I hadn't already left the immediate safety of my car. 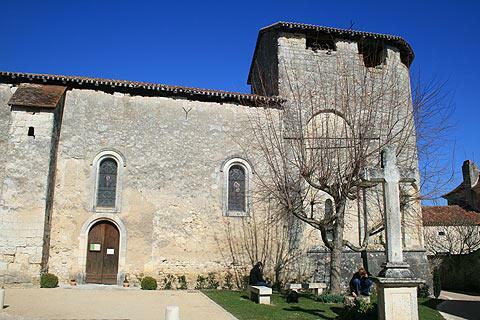 Festalemps: the Romanesque church at Festalemps is shown in the main photo at the top of this page. The lively town of Riberac makes a good base for exploring this part of the Dordogne. See also the churches at Saint Aulaye and Aubeterre sur Dronne. Aubeterre sur Dronne is particularly worth a visit, indeed it is the highlight of this northern part of the Perigord area. It is not only one of France's most beautiful villages but it also has an extraordinary Monolithic church - the tallest in the world.